Companies report things every day, but when Medco Health Solutions Inc. (the nation's largest pharmacy benefits manager, a.k.a. as a "PBM"), rivals Express Scripts, Inc. or CVS/Caremark Inc., or lab companies Quest Diagnostics or LabCorp issues a report, we know that they have mountains of data to back their claims, so their results are usually indicative of the nation's health as a whole -- one reason I'm more likely to rely on them for reliable information rather than the results from a small, tightly-controlled study with a shocking headline. For example, in 2006, Quest Diagnostics issued a Health Trends™ Diabetes Report which showed that people with diabetes who visit health professionals regularly were actually doing a better job of managing their disease (albiet only slightly better) -- in fact, the proportion of test results deemed to represent "good" diabetes control increased from 36% in early 2001 to a high of 56% in late 2005. Quest's data was in direct contrast to the persistent doom-and-gloom forecasts from the ADA and many others. But unlike some of those who made claims to the contrary, Quest actually had data from 14.3 million HbA1c test results to prove their claims! That's one reason I was interested when Medco Health Solutions issued its Drug Trend Report (archive link Drug Trend report) the other day. Medco Health manages the prescription benefits for about 1 in 5 Americans, and they examined prescription records from 2001 to 2007 from a representative sample of 2.5 million customers, ranging from newborns to the elderly. The headline was really no surprise: diabetes medicines have become the leading driver of prescription drug spending growth. How could they not be? We hear stories all the time about how diabetes has become epidemic and that more and more people are being diagnosed, so its hardly shocking. But beyond the headlines, the report actually reveals several more troubling trends. First, Medco's data shows that during 2007, 51% of American children and adults were taking one (or more) prescription drugs for a chronic condition, up from 50% the previous four years and 47% in 2001. In essence, this means that we have finally reached the point where a slight majority of all Americans will now be taking medicines for the rest of their lives -- and these aren't the elderly, but people in the prime of their lives. This is a scary finding that somehow only made the news coverage in the Washington Post -- everyone else was beating the headline about diabetes spending to death. What's more, when you peel away the headline about diabetes drug spending, there was another troubling finding that was hardly even acknowledged: while use of diabetes drugs increased only 2.3% last year, spending rose 12%. Meanwhile, thanks to cheaper generics, spending on cholesterol drugs fell significantly. What does this mean? The Wall Street Journal Health Blog said it best: "the introduction of new, expensive medicines that replace or are added to older, cheaper ones" is what's driving this spending, NOT the fact that more people taking these drugs. We can thank more costly insulin analogs (the report cited Novo Nordisk's Novolog specifically, as Sanofi Aventis' Apidra had considerably less influence). Although it wasn't mentioned, we can also conclude that Medco has cut themselves a very big bulk discount from Novo Nordisk as one of the biggest buyers of these medicines. Several years ago, United Healthcare pushed Lilly's Humalog to its third drug tier (which have the highest co-pays), which no doubt contributed heavily to Lilly's market share slide. Regardless, this should call greater attention to the need for generic biopharmaceuticals which I first reported on a few years ago. One thing I find very curious that there is a lack of compelling evidence that costly, patent-protected insulin analogs actually deliver superior glycemic control. We already know that Germany's Institute for Quality and Efficiency in Health Care (IQWiG) conducted a comprehensive meta-analysis of virtually all of the clinical trials that were undertaken for insulin analogs and IQWiG determined that there was NO reliable scientific evidence available of the superiority of rapid-acting insulin analogs over regular insulin in the treatment of adult patients with type 1 diabetes. Furthermore, the nation's healthcare system is paying, on average, 50% more for insulin analogs, yet no one has determined whether the incremental cost is justified? Perhaps we should take a look at Quest's data and examine whether the reduction in HbA1c is sufficient to justify the cost associated with these more costly new drugs? There are a number of new, and costly type 2 medicines which are also helping drive these costs. 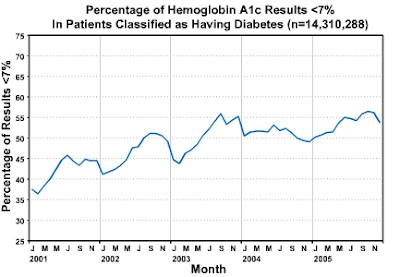 The chart above merely shows the percentage of people who had HbA1c's below the 7% threshold, but its theoretically possible to probe into whether the decline is statistically significant, and whether these costly new drugs can be attributed. Perhaps its about time for our leaders in Congress and the Department of Health and Human Services to take a closer look at this data? Clearly, the information is out there, but someone should be investigating these issues. After all, we can talk about controlling healthcare spending all we want, but it actually takes someone to actually do the hard work and examine these issues -- something that we have yet to see happen. But the investment might just be money very well-spent! Actually the percent of the population on prescriptions article made it into the humble Greenfield MA Recorder so it got more play than you think. I have to say that as much as I loved R, I'm really glad we have the alternative insulins. I'm using Apidra now and it meets up with my food in a way that is astonishing. And I finally got Levemir working (at a tiny but ridiculously effective dose) after having nothing but problems with Lantus. And for the first time in my entire life I have fasting bgs in the 80s just about all the time. Since I developed antibodies to R shortly after starting NPH I'd be SOL without these other choices. The rise in diabetes spending is due to one drug: Januvia and Janumet which every doctor in the world is putting all their patients on. I heard from an M.D. who recently published about Januvia in Annals of Int Med who believes it is causing 30,000 unnecessary cancers a year. He's taking on the FDA about it fortunately. I brought this issue up more than a year ago but lacking those magical initials, I could not get anyone to pay attention.